Material flow during friction stir welding of HSLA-65 steel was investigated by crystallographic texture analysis. During the welding process, the steel deforms primarily by local shear deformation in the austenite phase and then transforms upon cooling. 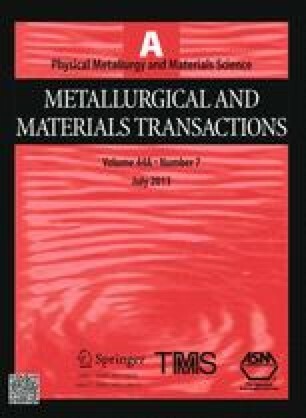 Texture data from three weld specimens were compared to theoretical textures calculated using ideal Euler angles for shear in face centered cubic (FCC) structures transformed by the Kurdjumov–Sacks (KS) relationship. These theoretical textures show similarities to the experimental textures. Texture data from the weld specimens revealed a rotation of the shear direction corresponding to the tangent of the weld tool on both the area directly under the weld tool shoulder and weld cross sections. In addition, texture data showed that while the shear plane of the area under the weld tool shoulder remained constant, the shear plane of the weld cross sections is influenced by the weld tool pin. Manuscript submitted August 13, 2012.